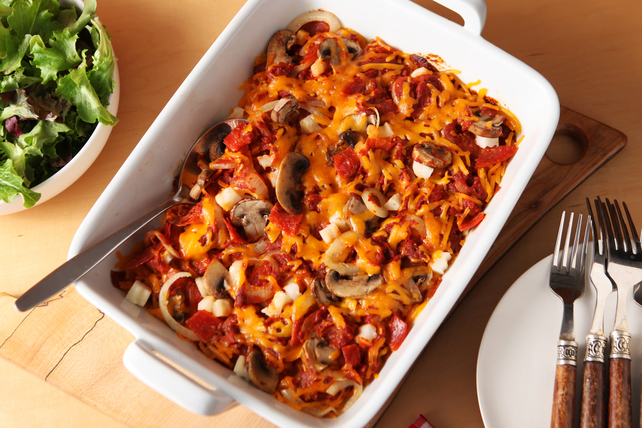 Frozen hash browns make this pepperoni and potato casserole a breeze to make. Bake until the cheese is melted—and enjoy! Reserve 1/2 cup cheese. Combine hash browns and remaining cheese; spoon into 13x9-inch baking dish sprayed with cooking spray. Top with remaining ingredients; cover. Bake 40 min. Sprinkle with reserved cheese; bake, uncovered, 5 min. or until melted. For a slight kick in flavour, sprinkle with dried oregano and crushed red pepper before baking.